Halloween was also known as All Hallows’ Eve in some circles. It goes as far back as about 2,000 years to a pre-Christian Celtic festival held around Nov. 1 called Samhain (pronounced “sah-win”), which means “summer’s end” in the Gaelic language. Halloween costumes and the tradition of “dressing up” may go back to a time when people would disguise themselves and go door-to-door, asking for food. Early costumes were usually disguises, often woven out of straw and there were times when people wore costumes to perform in plays or skits to celebrate All Hallow’s Eve. Trick-or-treating didn’t start in the United States until World War II. However, Halloween was as much a time for festivities and games as it was for playing tricks or asking for treats. Apples are associated with Halloween, both as a treat and in the game of bobbing for apples, a game that since the colonial era in America was used for fortune-telling. 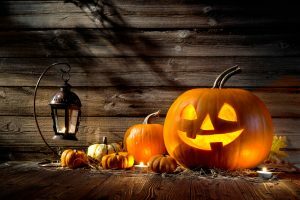 Halloween is a fun time of year for kids of all ages… but for orthodontic patients it can be a “nightmare” waiting to happen if braces are being damaged from eating the wrong treats. Watch this video put out a few years ago by the American Association of Orthodontists with additional “Halloween Brace Tips” for consumers that still very much apply today! At the orthodontic office of Lisa P. Howard DDS MS we love Halloween!! However, we feel it is important to educate parents and patients of the potential problems that can occur if orthodontic patients don’t pay attention to our foods to avoid list. All we ask is you make smart choices when choosing the candy you choose to eat. The orthodontic office of Lisa P. Howard DDS MS wants you all to have an extremely fun but safe Halloween. Be sure to contact us with any questions or to schedule an appointment. Happy All Hallow’s Eve! !